On Monday, couples all over will celebrate Valentine’s Day. They will surprise the ones they love with flowers, chocolate, and jewelry. These may be the traditional Valentine’s Day gifts, but they aren’t ones I can rely on. Then again, we do have a trip to Disney World coming soon. There are plenty of things there that could catch B’s eye. So this year, I’ll likely get B an IOU for one gift at Disney. 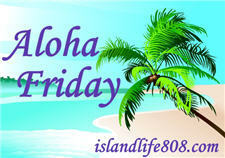 My Aloha Friday question for today is: What did you get the one you love for Valentine’s Day? My love and I agreed to stop giving V-day gifts and instead showing love all year long. With that said, I would love jewelry (nothing expensive) and my love prefers techy gifts. Well, I got him a bonsai tree for his office. I will be getting him something else not sure a the present time. I have to listen carefully to his wish. My husband and I don’t get each other Valentine’s Day gifts. We get a little something to give our kids but not for each other. I think your plan is perfect! Have fun at Disney. We aren’t Valentine’s Day celebrators anymore. Which is fine. I make treats for the kids and decorate inside for the kids. I do love the day and think it is a great pop of pink and red in an otherwise dull month of dirty snow. I am replacing a favorite coffee cup of his that broke….